Are you ready to join the millions who will get outside in the next three months to enjoy the wonderful weather of summer? Before you hit the trails, here are just a few words of caution about a pesky insect that’s causing increasing problems in both the U.S. and Canada. Blacklegged ticks live in the long grasses and forested lands that make up the surrounding areas of many of the cities and towns of North America. These insects feed on small animals, deer, and sometimes unlucky humans. Unfortunately, some animals can carry ticks with a bacterium called borrelia burgdorferi. This is the bacteria responsible for triggering Lyme disease. There are now about 20,000 cases of Lyme disease reported in the U.S. every year—though numbers are likely much higher due to unreported cases. Part of the problem with Lyme disease is that its symptoms can mimic many other health problems causing the condition to be misdiagnosed. Typically, someone who has contracted Lyme disease will experience symptoms similar to those you would expect if you had the flu: fever, chills, headaches and muscle aches and pains. Sometimes Lyme disease causes the lymph nodes to swell as well. These symptoms will appear anywhere from a few days to a month after being bitten by an infected tick. What happens if you’ve been diagnosed with Lyme disease? Your doctor will prescribe a course of antibiotics. In most cases, this will do the trick. For Lyme disease that’s not treated in the early stages, multiple courses of antibiotics may be prescribed. Left untreated, Lyme disease could lead to neurological symptoms, irregular heartbeat, skin rashes, and extreme fatigue. You can protect yourself from the threat of Lyme disease by making sure a tick can’t bite you. They typically latch on to exposed skin below the knees, so before you head off into a woodland or grassland trail, opt to wear long pants and cover your ankles with socks. Avoid open-toed shoes like sandals. Wear long sleeves if you’re wading through tall grass and or shrubs. That being said, ticks can potentially attach and feed anywhere on your body. They love hard-to-see areas such as the groin, armpits, and scalp. Ticks usually need to feed for about 48 hours before they can transmit Lyme disease—so if you see one on your skin, don’t panic. Get help to remove it. Keep in mind that ticks like cool, moist places. You won’t find them sunbathing in bright, hot sunlight. If you live in an area where ticks are a potential problem, try to make your property inhospitable to these critters. If your yard backs onto any wooded areas, create a wood chip mulch barrier between your lawn and the start of any brush. Keep lawns mowed and short. Keep an eye on your pets—they are susceptible to carrying ticks too. 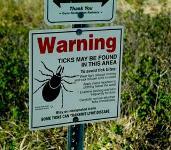 Ticks can carry other illnesses besides Lyme disease, though Lyme disease is by far the most common. This disease often goes misdiagnosed, so if you have any of the symptoms listed above, and you’ve been out and about recently, get yourself checked as soon as you can. “Lyme disease: Tiny tick, big problem,” CBC news web site, May 17, 2013; http://www.cbc.ca/news/health/story/2013/05/17/f-lyme-disease.html, last accessed May 27, 2013.